B+B SmartWorx labels the data lines on RS-422 and RS- 485 with an “A” for negative or “B” for positive, to indicate the positive and negative relationship between the two data lines. It is important to label the data lines because this positive and negative relationship between the lines must be maintained when connecting one device to another. Some manufacturers of RS-422/485 equipment label the data lines on their devices with “+” or “-”, Signal and Inverted Signal, or an “A” and “B” that are opposite to other converters or devices in the network. This can add confusion when making connections or troubleshooting a network with devices from different manufacturers. This application note addresses some of these differences, shows how they have come about, and tries to relate them to each other so that the system designer can interconnect devices from different manufacturers. Where Va and Vb are the voltages on the “A” and “B” lines respectively. Regardless of the naming scheme used, the primary consideration in any RS-422/485 system is that the inversions remain constant throughout the system. If we relate the above states to standard TTL logic, when the “A” line is greater than the “B” line, this would equal a 0 Volt TTL level. Conversely, when the “B” line is greater than the “A” line, this would equal a 5 Volt TTL level. 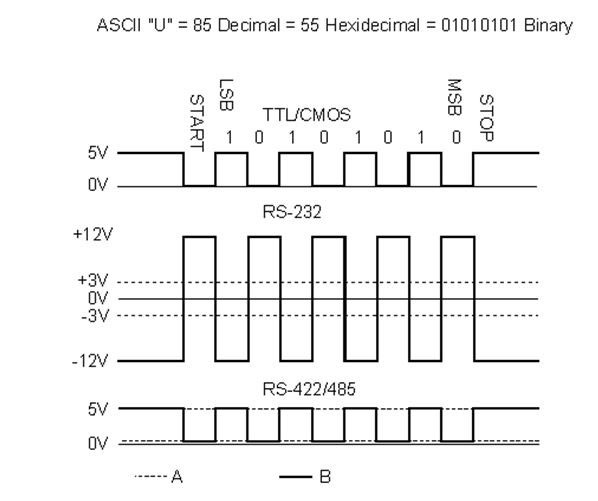 Figure 1 shows a typical asynchronous data byte and its corresponding signal levels in TTL, RS-232 and RS-422/485. ”A” and ”B” are opposite of what is shown in the standard. This has mainly arisen because manufacturers of RS-422 and RS-485 interface ICs have always used the convention of labeling the inverted pin of a differential transceiver as ”B” and the noninverting pin as ”A”. Even differential transceivers that pre-date or are not specifically designed for RS-422 or RS-485 use this naming scheme. Unfortunately, the ”A” and ”B” pin labeled on the IC datasheet does not necessarily have to correspond to the ”A” and ”B” in the RS-422/485 standard. It depends on the logic on the TTL side of the device. Many equipment manufacturers use the IC datasheet labeling and transfer the signal names to the names for their interfaces. While unsure where this scheme originated, it may have started with an attempt to clear up the ambiguities of the ”A” and ”B.” ”+” and ”-” is certainly more descriptive than ”A” and ”B” as to the relationship between the signals. In almost all experience and cases, the ”+” line will correspond to the RS-422/485 ”B” line and the ”-” will correspond to the ”A” line. In this case, the signal names used definitely correspond to the inverting an non-inverting pins on the transceiver IC. The “Signal” line will almost always correspond to the ”B” line of the standard and the ”Signal” or ”Inverted Signal” will correspond to the ”A” line in the standard. B+B SmartWorx tries to include the RS-422/485 specifications’ naming scheme on all of its products. Because of its common use, most B+B datasheets and product labels also include the ”+” and ”-” naming scheme along with the ”A” and ”B”. Reversing the two lines in the differential signal is by far the most common initial error when connecting two pieces of RS- 422 or RS-485 equipment. The good news is that it will not cause damage to your equipment if you connect it the wrong way. If you try it connected one way and see garbled data, reverse the leads, and try again. 1. Measure the voltage across the two lines at the Receiver without the driver connected. On an RS-485 device, the driver and receiver are on the same pair. 2. Note which signal line that the positive lead of the voltmeter is connected to. 3. Is the reading positive or negative? 4. If the reading is positive, the signal line going to the positive lead of the voltmeter corresponds to the ”B” line of the RS-422/485 standards. 5. If the reading is negative, the signal line going to the positive lead of the voltmeter corresponds to the ”A” line of the RS-422/485 standards. Additional articles about RS-485 are available on the B+B SmartWorx website or contact B+B SmartWorx Technical Support team for assistance.